While passing Tottenham Court Road Tube station in central London last week, I asked the friend I was with - who's been connected with the rail industry for many years - if the absolute magnitude of how I see the Crossrail project is a true reflexion on the actual task-in-hand? His response? He then elaborated, confirming much of what I'd considered to be the incredible task ahead (the first exploratory works commencing beneath our feet at the time). While his words were pretty pessimistic in terms of timescale and likelihood of coming in on time and budget, they stopped short of Go-Ahead Group chief executive Keith Ludeman's remarks recently: "Let's be honest about Crossrail. Can we actually say that this thing is fundable and will happen? I think certainly in my working lifetime, absolutely no chance." So, what exactly is Crossrail and where are we so far? Plenty who read this blog are only interested in buses and will have no doubt heard of this "London thing" that's the next big event to open after the 2012 Olympic Games, but know little else. 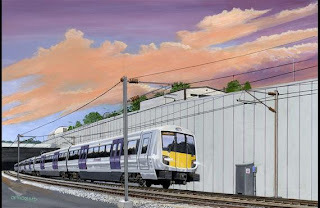 Originally called Cross London Rail Links Ltd, Crossrail Ltd is a new cross-London railway line that will link Maidenhead in the west with Shenfield in the east, with spurs to/from Heathrow and Abbey Wood. From just west of Paddington Station, the line will descend below the streets of London, not emerging until Stratford (Shenfield branch) or just before its Abbey Wood terminal on the branch of the same name, although on this stretch both Custom House and Woolwich stations will be above ground. A total of 38 stations will be served, 8 of which will involve creating new, underground interchanges between existing Tube lines and mainline over-ground rail termini. Serving Heathrow, the West End, Canary Wharf and the City, Crossrail is expected to open in 2017 and to carry 200 million people annually. The main construction work commences next year. It was on 5 October 2007 that Crossrail effectively got given the green light, with PM Gordon Brown announcing a funding package of £15.9 billion for the scheme. This started the process of having the Crossrail Bill read in both chambers within the Houses of Parliament and was finally given Royal Ascent on 22 July 2008. The final significant milestone to date was on 4 December 2008, when London Mayor Boris Johnson and Secretary of State for Transport Geoff Hoon signed the scheme's key agreements that were underwritten by the Department for Transport and Transport for London (TfL). This saw the Crossrail Limited scheme become a wholly owned subsidiary of TfL the following day. Crossrail was justified for many reasons. The route passes through a significant number of regeneration sites. Stratford, the Thames Gateway and Heyes are seen as depressed areas and contributed to the 3:1 benefit:cost ratio Crossrail is calculated to give, generating an estimated £36 billion in Gross Domestic Product benefits over 60 years. Building the system will employ around 14,000 full-time employees around its construction peak in 2014 and will make substantial use of local people. Once operational in 2017, Crossrail will employ around 1,000 people. Perhaps the main reason for building Crossrail is that it will bring an impressive 1.5 million people within a 1 hour commute into central London and that this will significantly contribute to the 200 million annual journeys made using Crossrail. It will be possible to, for example, board a Crossrail train service from Tottenham Court Road and travel direct to Heathrow Airport, or board at Slough and alight at Whitechapel. An artist's impression of a Crossrail train emerging from the central London (subterranean) section. Crossrail trains will initially consist of 10-car trains, with platforms built long enough to accommodate possible increases to train formations by an additional two carriages. There will be around 600 air-conditioned trains, all 20 meters in length with total capacities being 1,500 each (including standees). We understand they will be built to 25kV ac electrification standard but with the possibility for 'dc third rail' operation should a line extension east of Abbey Wood be considered in subsequent years. 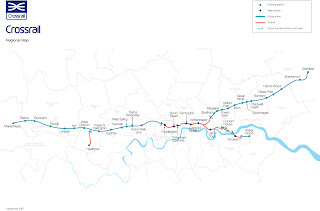 The Crossrail route will cover 73 miles, 60 miles of which is existing railway and 13 miles being new, mostly underground lines, at a typical depth of 85 feet. As for tunnel boring, the west of London will be the easiest, passing through London clay. The further east boring takes place, the more chalk, gravel and sand is found. There's also a fault line right next to Farringdon station that is likely to cause problems. I've always considered the boring process to be relatively easy compared to the mammoth task of linking these newly-bored tunnels with existing Tube stations and escalators and lifts to the surface for interchange with mainline rail stations. It seems to have taken contractors an eternity to complete the King's Cross St. Pancras Tube station, so imagine how long it could take to connect 8 simultaneously! To date, the first new underground station has started to be built at the Isle of Dogs, with work starting on 31 March and its completion needed before tunnel borers can start to excavate the line towards Abbey Wood, starting in 2011 and being completed in time for a short break for the Olympic Games. 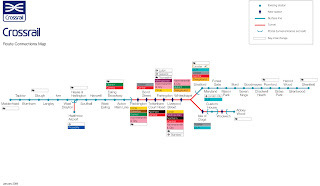 Crossrail linear map showing connections with other rail and Tube services - click to enlarge. 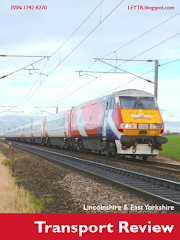 As to who will operate Crossrail train services, franchises for services in the vacinity and operating along affected lines will be renewed in 2014 (National Express East Anglia) and 2016 (First Great Western). These may be extended pending operational performance nearer their end dates, but any subsequent contract renewal beyond the projected Crossrail start date of 2017 will see London's Mayor and TfL make the decision and will tender for this nearer the time. Whoever is awarded the Crossrail franchise will have to initially operate 24 trains per hour through the central area (subterranean London), which will bifurcate eastbound to Shenfield/Abbey Wood, both branches receiving 12 trains per hour. Westbound, 14 trains per hour will terminate at Paddington, 2 per hour extending to and terminating at West Drayton, 4 per hour to Heathrow and 4 per hour through to Maidenhead. Not every train will call at all stations above ground.